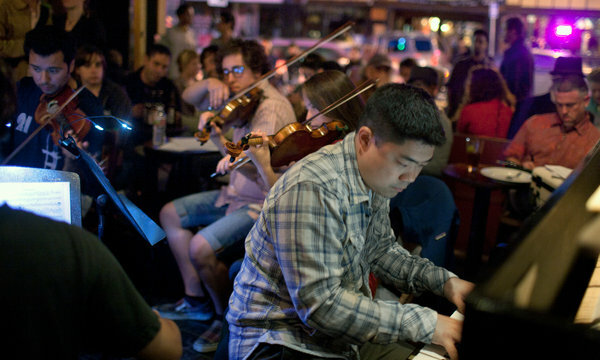 Ever since Classical Revolution, a loose collective of top-notch, classically trained musicians, started playing chamber music at the Revolution Cafe a few years ago, this Mission District bar has been packed on Mondays — not generally a big party night in town. “It’s usually so crowded in here that people can’t get to the bar,” said Joe Lewis, who programs the Revolution Cafe’s eclectic musical offerings, which include classical, jazz and Eastern European concerts. While classical music performances in nontraditional spaces are nothing new — the Kronos Quartet played weekly concerts in a Mill Valley restaurant as far back as 1978 — such events have proliferated in the last decade. Lately, it has been hard to go anywhere in the Bay Area without stumbling across a wind ensemble essaying John Adams in an art gallery or a string quartet playing Beethoven in a wine bar. In the less than five years since Charith Premawardhana, a violist, founded Classical Revolution, that organization has presented more than 500 local events featuring around 600 musicians at the Revolution Cafe; Red Poppy Art House; Yoshi’s, where it will release its first CD in October; and other spaces. The model has proved so popular with musicians and audiences, especially young crowds, that there are now about two dozen Classical Revolution chapters worldwide, in cities including New York, Montreal and Amsterdam. Word has spread among musicians and music lovers of the advantages of the low production costs and the pleasures of presenting and listening to classical music in a casual atmosphere. Often, musicians who experience a Classical Revolution show on their travels return to their hometowns and host similar events. The exponential growth of Classical Revolution and other innovative chamber music entities, like the San Francisco Friends of Chamber Music and Opera on Tap, point to a broader trend in classical music — with its traditionally lofty image and high ticket prices — of making it more approachable. Even orchestras are adopting Classical Revolution-style tactics. The San Francisco Symphony’s “Davies After Hours” program features orchestral musicians playing edgy repertory in the second-tier lobby at Davies Symphony Hall, transforming it into a nightclub-like setting with a cash bar, trendy furniture and a display of local artworks. The Napa Valley Symphony is collaborating with Classical Revolution to produce events in schools and wine bars. The Cleveland Orchestra’s chamber concerts at a bar called the Happy Dog inspired two busloads of bar patrons to attend a concert at the orchestra’s home, Severance Hall, last season. At Monday’s soiree at the Revolution Cafe, the appealing genre-bending quality of Classical Revolution was in full force. Assorted clusters of musicians read through a variety of works, including a concerto grosso by the Baroque composer Arcangelo Corelli and the Schumann Piano Quintet. A more polished performance by another part of the loose collective, the Musical Art Quintet, a string ensemble that specializes in playing music with a Latin flavor, followed the ad hoc jam session. Players switched in and out of the lineup throughout the evening and laughed when they made occasional mistakes. For musicians with regular orchestra jobs, Classical Revolution provides a low-key setting for music-making. “It is very refreshing to just roll up to a bar in jeans and a baseball cap and read some music,” said Adam Luftman, the principal trumpet of the San Francisco Opera orchestra, who has participated in around 15 Classical Revolution events. Classical Revolution also gives struggling musicians looking to build their careers some vital opportunities to perform, network and even make a little money. According to Mr. Premawardhana, musicians generally split audience donations, which amount to anything from $200 for the average Revolution Cafe session to $750 for playing at the Legion of Honor. Plus, performing classical music in nontraditional spaces often comes with drawbacks like poor acoustics, drunken audiences and the frequent comings and goings of makeshift concert settings, which can hamper the ability of a grassroots music organization to build a following. For example, Socha Café and Coda Lounge, two locations in San Francisco where Classical Revolution used to stage events, are now closed. Great review, thanks for sharing. Want recommend you one proven website to get music backgrounds for free http://melodyloops.com/ this is the best solution if you need to download content for commercial use, try to and I'm sure you'll like it.